As websites begin to provide more features and functionality to the end-user, it becomes important to provide useable design. User interface design is the design of websites that is based on user experience and interaction with the website. Typically, good UI design makes programming a little more complex. We strive to balance between implementing good UI and project budgets and costs. Take a look at some sample UI pages that we have done for our clients. Children’s Plus Inc is a bookbinding company that serves the school system and libraries throughout the United States. They prep books before shipping them to their clients. Their services may include binding books with hardcovers, adding catalog slips and cards, adding bar codes and security theft devices. As such, their online ordering system is very complicated because of the myriads of options that are available to their clients. When Children’s Plus first developed their online application, little thought has gone into the user interface design of the application. As a result, no one was using the online application because customers found it cumbersome and the lack features to complete the order. Evo revisited their application and designed the entire application from ground up. We created a more intuitive way to choose options and developed the ordering process flow. Seen here are the first 2 steps of a simplified 4-step ordering process. Miore page of the UI can be seen here. 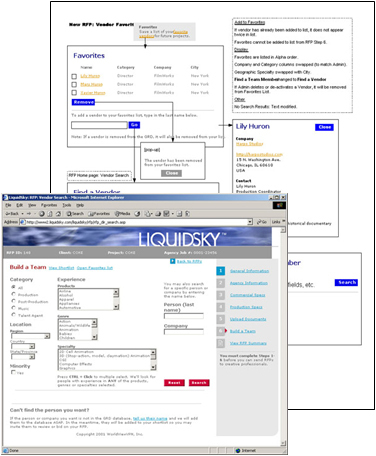 LiquidSky’s application matches directors and production facilities with advertising agencies on a global scale. The challenge was to take a very manual and human-interactive process, and translate that into an online experience that everyone can use without much training. In other words, an intuitive user interface or UI. 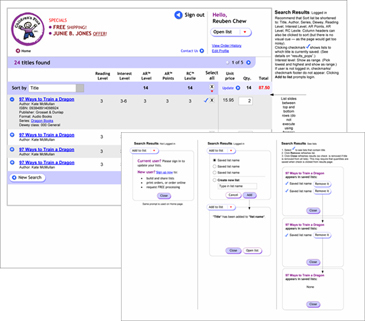 Our solution was to document the haphazard process, and create a formalized online user interface that made the complex process easy to understand and use. Rather than building the application from the ground up, we built a database-driven application that integrated into an existing third party software. This application allows users to stream video online, and annotate and collaborate on video projects from different parts of the world. Pages of the user interface (UI) can be seen here.